Caves are an excellent place to look for bones since they offer shelter to a wide variety of animals. From bats and small rodents, to javalina and mountains lions, many animals live in or regularly visit caves. Our caves are mostly dry, which helps preserve animal bones as well as other paleotological resources. Cathedral cave has a vertical entrance drop of about 25 feet and this acts as a natural animal trap. Once a hapless animal falls into the cave, they most likely will not be able to get back out. This results in a wide variety of bones over long periods of time. One victim of this natural trap was an extinct Pleistocene Oxen. Recently, we had a group of javalina dig up a section of Indian Cave which resulted in a debris pile consisiting of scores of bones. Most of these bones were deer mandibles, but we also found unknown teeth, horse and other ungulate bones. 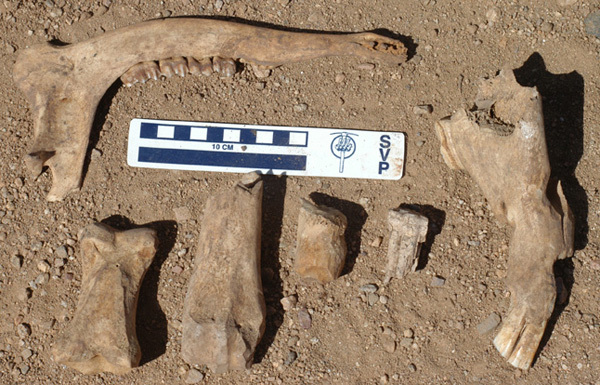 Currently Dr. Jim Mead and other Paleontologists at NAU are studying these bones. Concurrently we have NAU archeaologists looking at cultural relationships of these remains. Due to the high concentration of deer bones, the javalina may have been dug up from an Indian trash midden.